Home centers report that there is a growing interest in back- and front-yard gardens. Garden stores carry a large assortment of seeds and starter plants. In addition to in-ground planting, growing vegetables in raised beds or containers is also popular. Outdoor spaces for entertaining and relaxing are becoming highly sophisticated. The old-style barbecue and rusty metal outdoor furniture are a thing of the past. 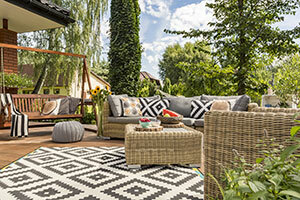 Weather-resistant furniture, fire pits, built-in sinks, grills, and even TVs are now popular. Consumer Reports states that fire pits, benches, and tables are now sold in modular kits for easy assembly. Walkways and decks come in stone or synthetic materials, making them versatile and long lasting, and are often do-it-yourself projects. Backyard fountains are delightful natural accents that transform your patio space. Add a small table fountain or a large patio fountain to your backyard space and relax to the soothing sound of moving water. If you want a lower maintenance yard, it makes sense to replace some or all of your lawn with native plants that grow well in your area, since these plants won't need as much water and fertilizer. If you plan to replace most of your lawn, research native grasses and ground covers that will survive in high foot-traffic areas. For more information about replacing your lawn with native plants go to: www.epa.gov/watersense/what-plant. The Environmental Protection Agency reports that an astounding nine billion gallons of water are used daily in the US to water lawns and plants. Replacing sprinklers with a drip irrigation system, which directs water to the plant roots, is an efficient way to keep plants lush and green. Technology like climate sensors can keep track of climate conditions and efficiently regulate the irrigation. Another good practice is to use your lawn clippings as mulch; nutrients are returned to the soil, reducing the need for fertilizer. If you don't feel confident in planning new features for your yard or you have no idea how to choose plants, hire a garden coach or landscaper. It's worth spending money to get an expert's advice; just be sure the person you hire is accredited by an association like the American Society of Landscape Architects.